When you ride on the Powder Department Runs you leave the secured ski area! These runs are NOT groomed, have NO avalanche protections (nor for any other alpine dangers) and are NOT checked. The Powder Department Runs are (as is always the case in the open ski area) not closed nor declared being “open”. You act exclusively at your own risk and are outside of the liability area of the lift operators, who only provide the open, groomed pistes and ski routes and do not assume any liability. 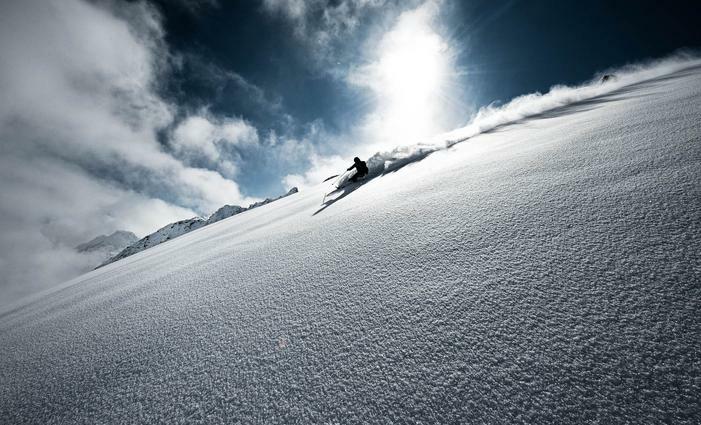 The Freeride Runs should only be entered with a certified mountain and ski guide. Minimizing the avalanche risk starts not only on entering the open ski area, but at home!Careful reading of the current avalanche report gives first information: What is today basically possible? The “Tyrolean Mountain Rescue Emergency APP” offered by the Tyrol section has been developed for emergencies in the alpine area. With a click on the APP your location (GPS coordinates) is transmitted to the Tyrolean coordination centre in a case of emergency. At the same time a telephone connection is established. The required emergency rescue teams are alerted and dispatched. The use of searching devices must be continuously exercised, to be able to use it in an emergency situation. The ORTOVOX STATION (advanced rescue training) system is a compact and technically mature facility for practising the search of buried victims with avalanche rescue beacon and avalanche probe. It can be used daily free of charge with your own Equipment. Avalanche Transceiver TRAINING How to use avalanche transceivers, shovel and proble can be exercised in cooperation with ORTOVOX at the Gamsgarten mountain station. On request also with mountain and ski guides as listed. Safety and assessing the risk is of major importance for off-piste skiing and snowboarding. First place of contact for getting information ist he Freeride-Checkpoint at the Eisgrat top station. On the large display board you find route descriptions, weather, snow and avalanche reports, information on slope exposition, avalanche transceiver check etc. On each trip into the powder snow you have to carry safety equipment (avalanche transceiver, probe, shovel and mobile). You can rent the equipment (helmet and rucksack also) at the Sportshop Eisgrat directly in the mountain station. All who do not know about the dangers in alpine terrain, we recommend entering the unsecured ski area with a certified freeride guide only. crevasses, avalanches, snow storms, sudden incidences of fog and also intense sunlight. Outside of the marked and open slopes you alone are responsible for your own safety! You are venturing into high-alpine, glacial and avalanche-prone terrain. Appropriate equipment and knowledge of the dangers involved is essential! Inform on the current avalanche situation before heading for the back-country. When riding down the Powder Department Runs you are leaving the secured ski area! The routes are NOT groomed, NOT safe from avalanches (or other alpine dangers) and are NOT checked. The Powder Department Runs are (as is usual in open ski areas) neither barred nor declared as being open. You act exclusively at your own responsibility and are outside of the liability area of the lift operators. The operators offer the open, groomed pistes and ski routes and assume no liability whatsoever. Fresh snow or rain always increases the risk of avalanches. The first nice day after snowfall is particularly prone to accidents! It is often easy to trigger fresh snowdrift accumulations. Rapid, marked warming and/or strong sunlight increase the risk of avalanches. Low visibility (fog) makes orientation and the assessment of avalanche risk more difficult. If you are not sufficiently informed on alpine dangers and avalanches, please book a training session with a pro (e.g. guided mountain or ski guide) before going into the open area on your own.